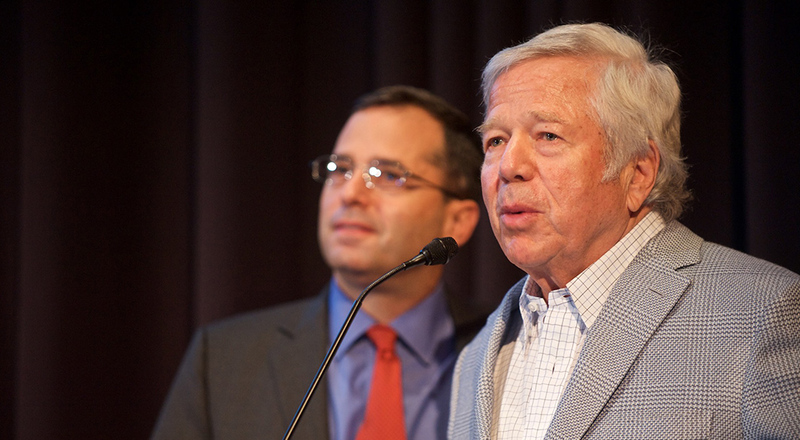 Robert Kraft and The Kraft Family Foundation have donated $25 million to establish and provide ongoing support for The Kraft Center for Community Health. Robert and Myra Kraft envisioned The Kraft Center in 2010 with the mission to expand access to high-quality, cost-effective healthcare for medically underserved patients, families and communities. Robert and Myra Kraft each came from families that taught and practiced the principles of philanthropy. Fifty years ago, they began their own mission of philanthropy and taught their children the importance and value of giving back. Robert Kraft is the Founder, Chairman and CEO of The Kraft Group, based in Foxborough, Massachusetts. The Kraft Group is the holding company of the Kraft family’s many businesses, including the New England Patriots, the New England Revolution, Gillette Stadium, Patriot Place, International Forest Products, Rand-Whitney Group, Rand-Whitney Containerboard and a portfolio of more than 100 private investments. Robert’s compassion is driven by a belief that everyone – regardless of their socioeconomic status—should have access to quality healthcare. Today, with hundreds of millions in donations from Robert, the Kraft family, and their foundations, the power of philanthropy has been felt by youth and families around the world by assisting programs that foster cultural diversity, education, family and health. Robert is assisted in The Kraft Center’s programmatic activities by Joshua Kraft, Nicholas President and CEO of the Boys & Girls Clubs of Boston, President of the New England Patriots Charitable Foundation, and a leader in community outreach programs.